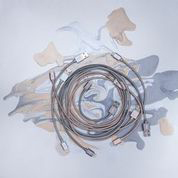 The Belkin metallic lightning cable allows you to charge and sync all your Lightning connector devices quickly and safely, using just one cable. Simply plug the USB end directly into any USB port to stay connected while you're at home, at work, or on the road. It is specially made for iPod, made for iPhone, and made for iPad. This mean that an electronic accessory has been designed to connect specifically to iPod, iPhone, or iPad, respectively, and has been certified by the developer to meet Apple performance standards. The perfect color matched to complement your iPhone 6. As always, you can mix and match with other MIXIT products and colors to create your favorite combinations. The longer 4-foot MIXIT Lightning to USB Cable can reach the perfect distance while still being compact enough to toss in a bag and go. It plugs into any USB 2.0 port, so you can use it virtually anywhere.